Of all things that should not receive government funds, abortion has to be at the top of the list. The government should be protecting its citizens, not assisting in dispatching them. According to National Review, Governor Chris Christie, in his budget cutting for the State of New Jersey, removed $7.5 million in public funding that was slated to go to Planned Parenthood. Although the state legislature included the funding in their budget, Governor Christie vetoed the measure. Thanks to some Republicans who did not join the vote, the state senate was unable to override the veto. As a result, one Planned Barrenhood (Parenthood) clinic in Cherry Hill is already slated to close. Deo Gratias! "... there are still many reasons for hope in the U.S. For example, when the Helpers Apostolate started more then twenty years ago, there were 2200 abortion clinics in the United States and about 700 Life Centers. Today in the United States, there are 700 abortion clinics and more than 2200 Life Centers. 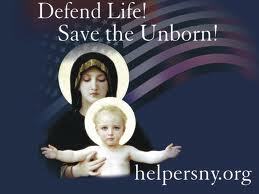 Twenty years ago here in the Diocese of Brooklyn 43 places advertised abortions and today it is down to 18. Every major poll now shows that the majority of Americans identify themselves as pro-life. Across America today, I believe, the prayerful presence of God’s people with their good shepherds outside these abortion mills has played no small part in the closing of these mills and the changing of so many hearts to choose life. Please continue your sacrificial presence at these abortion sites because there are still distressed pregnant mothers that need your loving, prayerful presence and help. The victims of this on-going immoral earthquake need today and tomorrow unsung generous rescuers to help the unborn children to get out of their mothers wombs alive and restore peace to their wounded mothers."